Talk to any student of military history and they will tell you that there are three historic combat arms: infantry, cavalry, and artillery. Any army is actually more complex than that, and those three don’t take into account things like the navy or the complexity of today’s Army, let alone the other branches of service; but if you go back into history far enough, that’s all there was… at least for land warfare. Another way of looking at this is that there were three categories of weapons: melee weapons, ranged weapons, and flexible weapons. This allows for archers, which the first list doesn’t really allow for. This is an important distinction as the bow is one of the oldest weapons of warfare there is with one of the longest histories of use. Trebuchets (siege warfare). Castle of Castelnaud, Dordogne (Perigord), Aquitaine, France. Ranged weapons have varied considerably throughout history – from rocks and slings on the small end to intercontinental ballistic weapons on the large end. 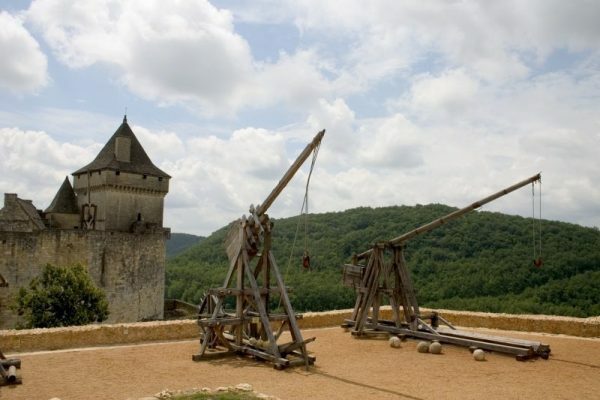 Anything that would be considered artillery would fall into this category as well, including trebuchets and catapults. 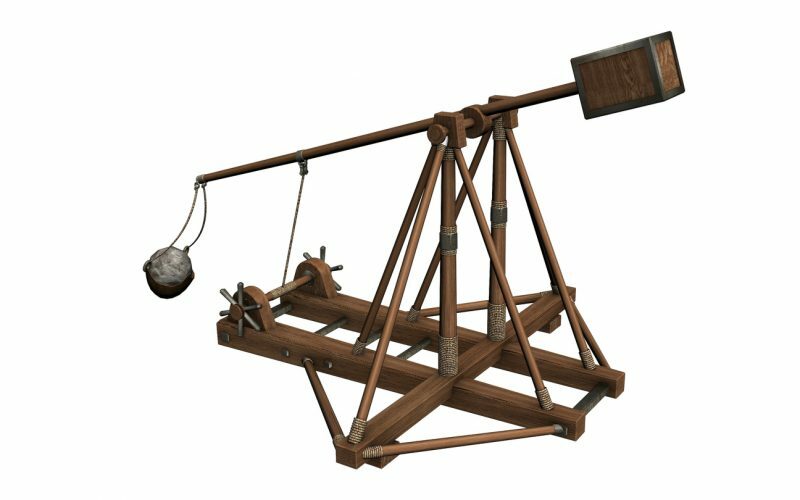 People vary somewhat in their definitions of these two devices as trebuchets are a type of catapult. However, there is an actual difference between the two. Catapults use spring tension to provide the force to throw a weight. This can either come from a tightly-wound rope around an axle, a large bow connected to the lever arm, or from a springy pole used as the lever arm. One end of this lever arm is attached to an axle, which is mounted into the framework of the siege engine. Trebuchets, on the other hand, use weight to propel the lever arm. The arm is generally longer (as long as 60 feet) and mounted off-center to the axle. The longer arm holds the shot to be thrown while the shorter one has the weights. These were usually held in some sort of sling, bucket, or basket – although, with some smaller trebuchets, soldiers pulled on ropes and their bodies essentially performed the function of the weights. The unequal arm lengths allowed for a greater acceleration of the shot to be fired because the longer arm had to travel much farther than the short arm. 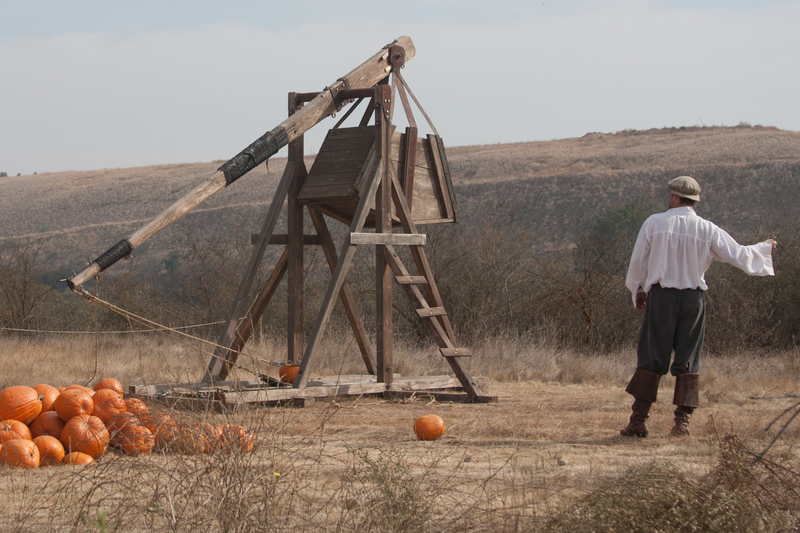 Like many other things, trebuchets were invented in China. They were used by the Mohists as early as the 4th century BC. They were used in Europe throughout the Middle Ages and actually saw use in World War I. During the “War to End all Wars,” catapults were used in trench warfare to lob grenades across “no man’s land” to the opposing army. By the end of the war, these were replaced by mortars. We still find a form of catapult in use today on aircraft carriers for the purpose of launching aircraft off the ships. These are very different from ancient catapults in that they are steam driven, yet conceptually they are doing the same work – just launching an airplane down the ship’s deck and into the air instead of launching a rock into the air. 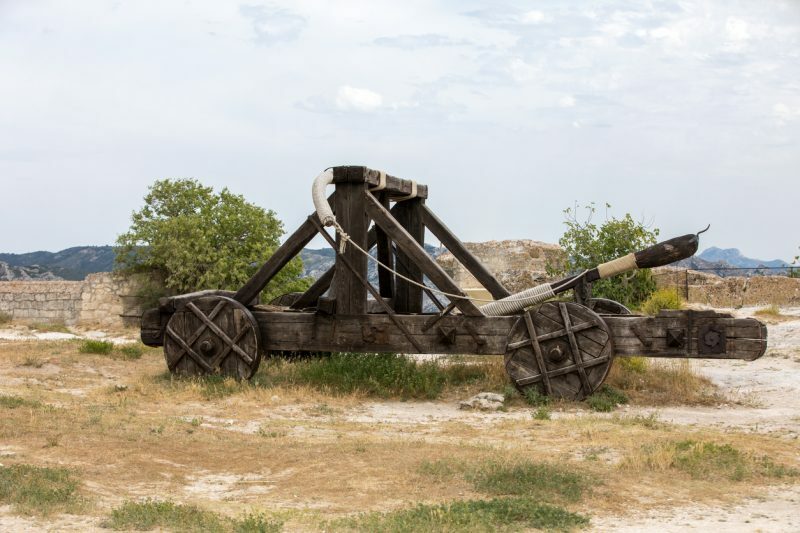 Throughout the Middle Ages, trebuchets and catapults were a major part of medieval warfare. Like the artillery of today, they were the biggest “gun” on the battlefield and were able to create the most damage. Of all the weapons that an army might have, they were the only ones that could directly attack the walls of a castle or other fortification and cause significant damage. This made them an essential part of siege warfare. Catapults of all sorts are primarily offensive weapons intended for attacking a fortification. However, those inside the fortification would often have them as well so that they had a means of providing counter-battery fire against their attackers. 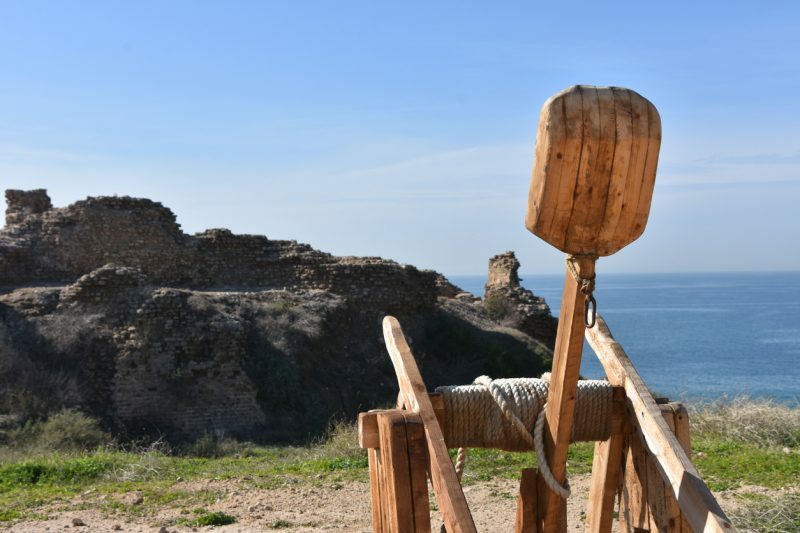 As soon as the attackers started hurling rocks at the castle walls or gates, defenders would try to use their catapults for counter-battery fire. 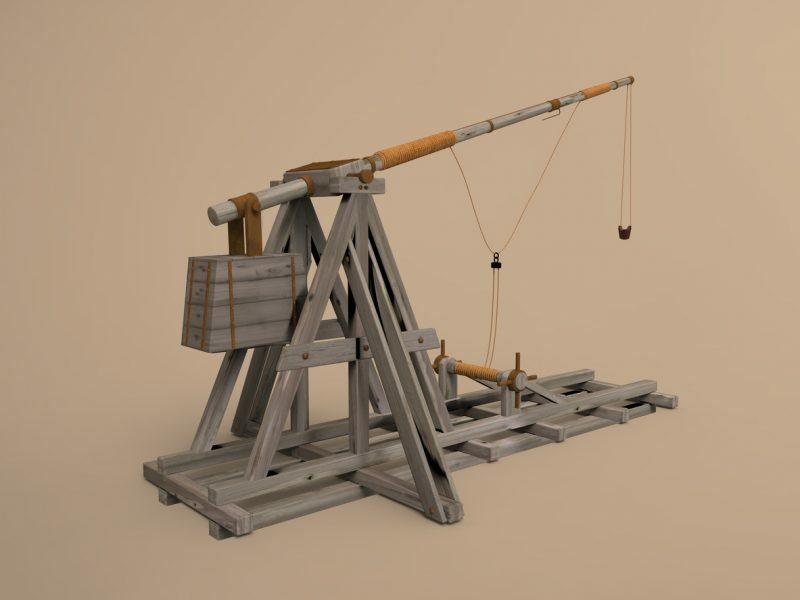 This could break down into a catapult duel, depending on the skills and philosophy of the commanders, until the catapults of one side or the other were destroyed. 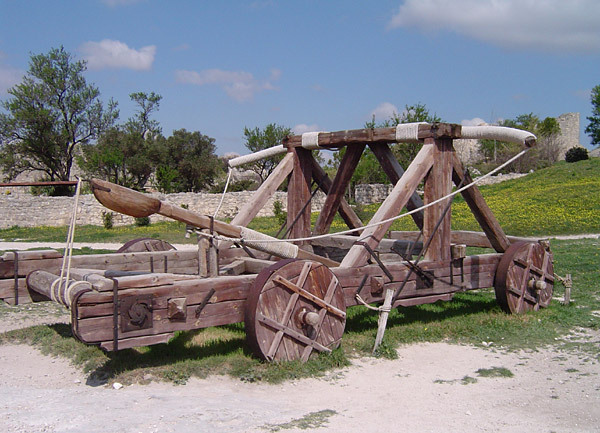 Thanks largely to Hollywood, there are some misconceptions about how these siege engines were used. First of all, they were usually built on site – as were other siege engines (towers, battering rams, ballista). Moving such massive objects was difficult at best, so it was actually easier to build them during the siege. Rope and metal fittings would be brought with the army, and trees were felled to make the device. Considering that the average siege lasted for months, before an attack was made there was plenty of time for the attackers to make these weapons. Another misconception about catapults and trebuchets is that they rarely threw any sort of “greek fire” or other flaming shot. Because they were intended mostly to be used against stone structures, fire would not have done a bit of good. Secondly, while making flaming shots wasn’t particularly difficult, it required bringing something combustible – usually oil or tar. While these were used at times, they would not be used unless there was a benefit to be gained other than just striking fear into the defenders. Catapults of various sorts were also used to perform the earliest forms of biological warfare. Dead animal bodies, dung, and dead human bodies were thrown over castle walls with the idea of spreading disease amongst the defenders. This mighty weapon of war was the most powerful weapon on the battlefield, even after the invention of the cannon. While cannons were cast as early as the 1300s, they were not widely in use. The sheer cost of making cannons, as well as of acquiring a sufficient supply of gunpowder, made them impractical to all but the wealthiest lords. They were also impractical to move until the 1500s because of their large size and weight. It wasn’t until the Civil War that cannons were truly used as mobile weapons and had the ability to move around the battlefield. Is there a place for catapults in modern-day survival? Maybe. A lot would depend on the specific survival situation one was facing and what sort of enemies one might have. Catapults are notoriously poor anti-personnel weapons and are better suited for use against fortifications and other siege weapons. So, if you end up being attacked by a gang of hungry people, you’re better off sticking to your guns and leaving the catapult alone. On the other hand, if you have attackers approaching your survival retreat in vehicles, a catapult might be the best defense you could have against them. It’s hard to stop a moving vehicle with a rifle or shotgun, but a large rock hitting the engine or passenger compartment could have some serious effects.